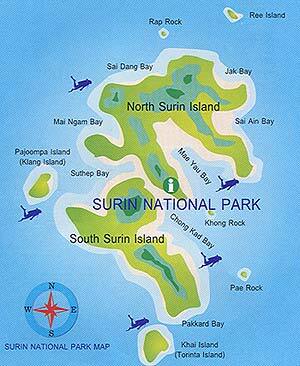 Koh Surin National Marine Park rates as one of Thailand's prime island locations. The two main islands Koh Surin Nua (North Surin Island) and Koh Surin Tai (South Surin Island) form the bulk of the land mass. The other 3 satellite islands both enhance the overground vistas and provide supplementary fringing reef. The entire Surin archepelago covers a region greater than 320 km² and includes the picturesque island of Koh Tachai and sublime scuba diving at Richelieu Rock where the large pelagic favourites, Manta Rays and Whale Sharks, are often sighted. Arrive at Namkem pier and have some coffee and tea.